The Go Green Fly-in was a great success! It is with great sadness that I write that Carl Wagner has passed away. We will miss him. The next meeting will be Saturday May 4th, noon at Waymer Field. A note about the park passes and keys. WACAMA has sent out passes and keys to those that have renewed/ paid. Our April club meeting was held April 7th at the field. Minutes are available on the Club News/ Updates page. Please remember the park is a no smoking area. If you smoke be aware others don’t like your smoke. To fly at Waymer you need AMA and a Park Pass. There are dates and times this is waived, Wednesdays and 10-2 Sundays. You still need to know and follow the rules. To fly any R/C vehicle over .55lb anywhere in the U.S. (even your back yard) you are required to register with the FAA. If you registered when this first became effective three years ago it may say it’s time to renew on your card. When I went to renew mine it now says it expires 12/12/2020. Also remember those flying FPV need FCC licenses. While we have never enforced these please remember they are federal laws. 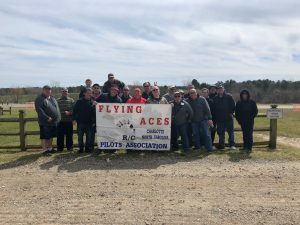 Please be aware that there is a difference between the WACAMA Park Pass and Flying Aces R/C Club Membership. To fly at Waymer field a Park Pass is required and AMA membership is required to apply for the Park Pass. FAPA Club Membership is not required to fly at Waymer. You can join FAPA at the same time you join or renew your WACAMA Park Pass for an additional $20. Want to learn how to Fly? You’ve come to the right place! Send an email to Evan – evan.doughty@juno.com. We have planes and the talent – All you need is the desire!